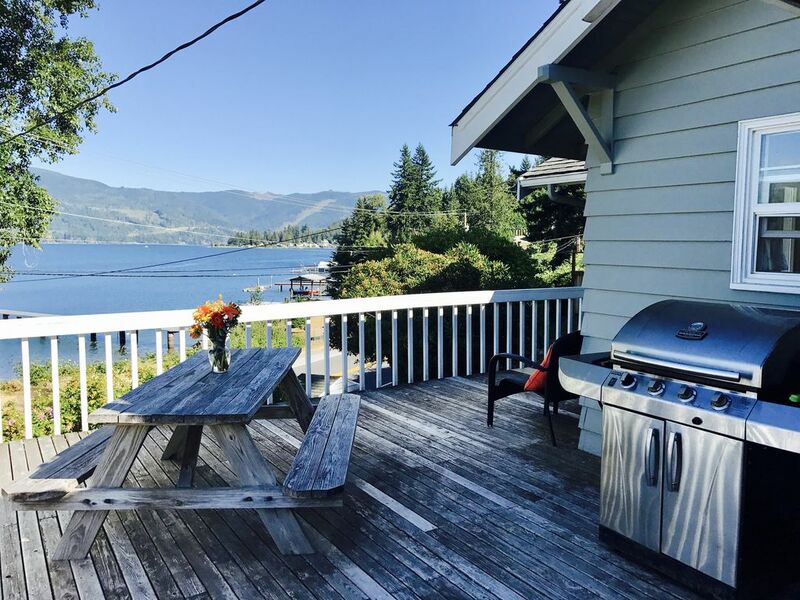 Captivating view from this quaint and cozy house on Lake Whatcom in the Geneva Neighborhood of Bellingham. Comfortably furnished with large fully equipped kitchen and everything you need for a fantastic time away from home. Delightful in all four seasons. Allergy safe home. We do not allow animals. Please do not ask. Spacious deck, view of the lake and foothills, open living area and large windows that look out over the lake. Set up with a feel of privacy, yet close enough to shopping and outdoor activities to satisfy all your wishes for a getaway. Shared beach access for swimming and fishing. 10 minutes from downtown Bellingham or beautiful Fairhaven, with boutique shops, waterfront parks and restaurants. 50 miles from Vancouver, British Columbia. An hour to Mt. Baker where you can ski, snowboard or sled in the winter or hike in the summer and fall. Wildlife abounds: waterfowl, deer, bald eagles. Bring your Kayaks or Canoe, or just enjoy curling up with a cup of coffee and a good book. Close to park, biking trails, walking trails and fishing. Close to town, restaurants, shopping and entertainment. The home is designed for 4 people. Though it can accomodate guests for BBQs, etc., parking is an issue. Please talk with us if you plan to have any gatherings so we can help make your time here special. We have lived in Bellingham for 25 years and love sharing it with visitors. Check in is 3:00 p.m. Check out is 11:00 a.m.
We stayed here as a launch pad for exploring Bellingham and this house is in a great spot. The living room is very comfortable with 4 big leather chairs for enjoying a cup of coffee or watching a movie and the deck provides a great view over the lake. It's close to Whatcom Falls Park which I highly recommend that everyone who stays here should fully explore with a mix of trails that everyone can enjoy. We visited the Spark Museum, another gem - be sure to book the electric show on weekends, it's worth it. Even my teenager enjoyed herself... We hit a few spots on the Bellingham Tap Trail and the sculptures on the WWU campus. The house has basic cable so I would recommend bringing DVDs to watch or grab Redbox DVDs locally where available, like we did. One word of caution is that the deer are plentiful so drive slow in the neighborhood. Lovely home with lovely view. The place was very clean and the beds were comfortable. Thank you! Beautiful house. Very quaint. Nice location with fun stuff nearby. We visit family in Bellingham often and have always been intrigued by Lake Whatcom. This 2 bedroom cabin has a wonderful view from the deck, kitchen and livingroom. It was a joy to wake up to every morning! We found the cabin to have almost everything we wanted and what it didn’t have wasn’t too important anyway. We only ate breakfast there so we didn’t do much cooking. It was also Fall weather so we didn’t do anything down by the water except walk the shore line a bit. One thing to be aware of is the driveway is shared by 4 properties and you have to be careful driving up to the parking area in the dark. We did see evidence that deer had visited but only actually saw the deer while driving. This cabin is perfect for 4 with both beds being very comfortable. Thank you for a wonderful 2 weeks! This cabin is beautiful, comfortable, and clean. The view of the lake is spectacular. We hope to come back next year! We were up in Bellingham to visit our WWU Student and were pleasantly surprised by our stay at the cabin. The leather chairs and ottomans went perfectly with my glass of scotch. Next time we'll use the woodstove, but we were just happy to relax with a few movies in the evening, a chance to wash a college student's laundry, and beautiful sunrises.